- there are lots of good ones, be selective and only choose to invest in the best. Similarly, look for the leaders with ambition who want to drive forward a project. We look for leaders who want open source their technology, who build models with the potential to scale, who will speak publicly about their successes and failures so that others can learn and benefit. ” and ‘LGBTQIA meaning”, increase year over year, it's clear that, now more than ever, we need to continue supporting Canada's growing LGBTQIA+ community and making sure we’re providing all members with equal opportunity and a voice. That’s why, this Pride, Google is celebrating families big and small, chosen or inherited. Over 150 employees and their friends and family from our Toronto and Kitchener-Waterloo offices will be marching in the Toronto Pride Parade as part of #ThisIsFamily. For the second year in a row, we're also marching alongside other companies within the wider Canadian tech community, including Facebook, LinkedIn, Microsoft, Twitter, Indeed, Buzzfeed and more, as "TechProud". Earlier this week, TechProud collaborated with local non-profit Venture Out to host a panel and workshop series at our Toronto office for more than 150 LGBTQIA+ tech professionals. At Google, we believe in the importance of storytelling as a tool to help connect like-minded individuals and our goal with this Venture Out series was to support and inspire our burgeoning homegrown LGTBQIA+ tech community. In Google Maps, this year's parade route is paved with 🌈rainbows🌈! We’re helping Canadian businesses declare their establishments "LGBTQ+ Friendly" or "Transgender Safe Space" on their business listings in Google Maps and Google Search. You'll also find rainbow "easter eggs" scattered through Google Search and G Suite, and you can join the fun from your desktop by switching your Gmail to a Pride theme for the month of June. Google.org has pledged to match up to $100,000 in total in donations to PFLAG, It Gets Better and GLAAD during the month of June. Throughout 2018, we want to continue supporting and celebrating diversity in the Canadian tech scene by acting as a better resource for LGTBQIA+ Canadians via our products and programs, improving diversity and inclusion across our offices and uniting Canadian tech leaders in support of the LGTBQIA+ community. From our family to yours, Happy Pride Canada!! As searches for LGBT-related terms, like “how to come out” and ‘LGBTQIA meaning”, increase year over year, it's clear that, now more than ever, we need to continue supporting Canada's growing LGBTQIA+ community and making sure we’re providing all members with equal opportunity and a voice. Not just music videos, but official albums, singles, remixes, live performances, covers and hard-to-find music you can only get on YouTube. Recommendations built for you. A home screen that dynamically adapts to provide recommendations based on the artists and songs you’ve played before, where you are and what you’re doing. Chilling at the beach? Need some motivation? The right music is right here, built just for you. Thousands of playlists across any genre, mood or activity. Try “A Dose of Sun” for brighter tunes on a cloudy day, “The Pop Hotlist” for the biggest hits around the world or Distrito Latino for Latin pop hits of the moment. Smart search so we’ll find the song, even if you can’t remember what it’s called. “That space-themed Spice Girls song in the desert.” Here you go. You can also search by lyrics (even if they’re wrong). It’s “Hold me closer, Tony Danza,” right? The hottest videos. We’ll keep you on top of what’s hot! The hottest videos in the world right now are right there, on their own dedicated Hotlist screen. So you can go check out that brand-new Degrassi-themed Drake video. The wait is over! Starting today, YouTube Music is available to everyone in Canada. Now Canadian fans can find more of the music they love and effortlessly discover new favourites. YouTube Music is a new music streaming service built on top of all the music on YouTube that you can’t find anywhere else - personalized & all simply organized in one place. It’s ALL here. Not just music videos, but official albums, singles, remixes, live performances, covers and hard-to-find music you can only get on YouTube. , providing you with a single place for your ad controls, and in 2011 and 2012 we introduced Why this ad? and Mute this ad, giving you more transparency and control over the ads that you see. In 2015 all of these were brought together in your Google Account, the all-in-one destination for managing your personal information, privacy and security settings. Today, we’re launching the new Ad Settings, which makes it easier for you to understand and control how your ads are tailored to you. We’re also providing more transparency around why you see certain ads by expanding Why this ad? to all of our services that show Google ads (like Search and YouTube) and almost all websites and apps that partner with us to show ads. The new Ad Settings shows all the different factors that determine how ads are tailored to you in one view. This way, it’s easier for you to see them at a glance, learn more about why you see ads related to these topics, and decide if there are any you want to remove. There are a few different factors that can determine how your ads are tailored to you, including: estimations of your interests based on your activity while you’re signed in, information you’ve added to your Google Account, and information from advertisers that partner with us to show ads—like if you’ve visited their site or signed up for their newsletter. For example, if you watched highlights from a recent soccer match on YouTube or searched “soccer fields near me” you might see an ad for a slick pair of soccer shorts. If you’ve told us you’re 40 years old, we would be less likely to show you ads about student study abroad programs. And if you visit the website of one of your favorite brands, you might see an ad from them. This information helps make ads more relevant and useful to you. However, in the new Ad Settings, if you no longer want us to tailor your ads based on one of these factors you can choose to turn it off. 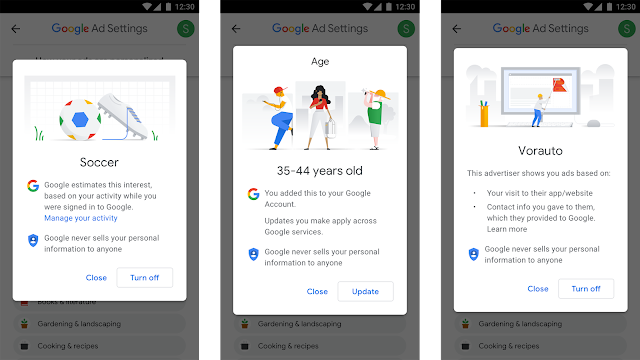 Turning off a factor means you’ll no longer receive tailored ads related to it across our services, and on websites and apps that partner with us to show ads, as long as you’re signed in to your Google Account. The ads you see can still be based on general factors, like the subject of what you’re looking at or the time of day, or any other factor that is still turned on. Why this ad? is a feature which appears next to ads and both helps you learn why you are seeing a certain ad and gives you easy access to your Ad Settings. For example, if you want to know why you’re seeing an ad for a camera, Why this ad? might tell you it’s because you’ve searched for cameras, visited photography websites, or clicked on ads for cameras before. We’ve now significantly expanded coverage of this feature; starting today, you’ll see Why this ad? notices on all our services that show Google Ads, such as ads on YouTube (including the YouTube app on connected TVs), Google Play, Gmail, Maps and Search. We’ve also expanded it to include almost all of the websites and apps that partner with us to show ads. The new Ad Settings and updates to Why this ad? provide you with more transparency and control over your Google ad experience than ever before. With these improvements, you can browse the web confidently knowing that you have the information and control to make Google work better for you. Over the years, you’ve told us that transparency and control over your data and ad experience are important. That's why we've built products and tools to help you manage that experience. Back in 2009, we launched Ad Settings, providing you with a single place for your ad controls, and in 2011 and 2012 we introduced Why this ad? and Mute this ad, giving you more transparency and control over the ads that you see. In 2015 all of these were brought together in your Google Account, the all-in-one destination for managing your personal information, privacy and security settings.
. The University of Toronto is one of 36 Actua network members across Canada annually engaging 250,000 youth in hands-on STEM learning. Nicole, a Grade 4 student from Kew Beach Junior Public School, was excited to visit Go North Youth today. "My favourite subject is math, so I couldn't wait to learn all about science and tech at the University of Toronto! I learned that sound can travel through two people's bodies, how to build a future city, plus a bunch of other really cool stuff." 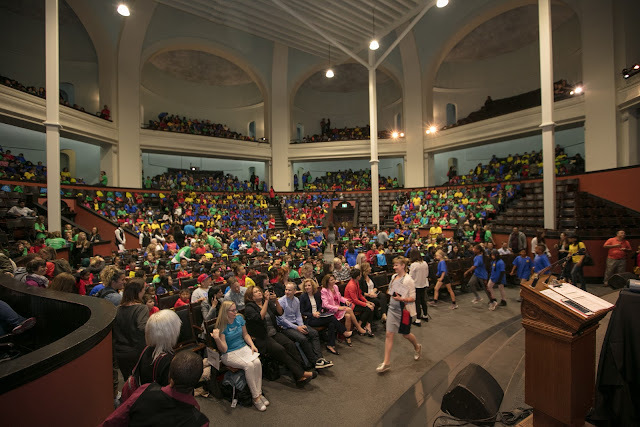 Today, for the third year in a row, Go North Youth gathered over 1200 students from grades three to eight in the University of Toronto’s Convocation Hall. Students from schools across the GTA came together for Canada’s biggest and most exciting day of exploration, learning and fun with cutting-edge science and technology. The day kicked off with a vibrant opening ceremony in U of T’s historic Convocation Hall that included performances by DJ Skratch, ActionPotential, and a special address from The Honourable Kirsty Duncan, Minister of Science, who got to personally welcome students from her own riding of Etobicoke North. 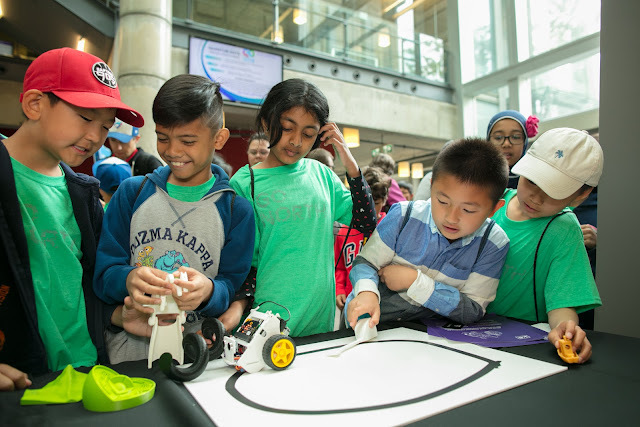 Afterwards, students explored Innovate Alley, where they went hands-on with fun science and tech, from creating 3D printed objects with Inksmith and testing Google’s AI game Quick Draw to dancing to cool rhythmic light installations from U of T alumni Nanoleaf. Students spent the remainder of the day participating in inspiring design and build workshops put on by the incredible team at U of T Engineering Outreach. As always, it is amazing to see students so engaged and excited to learn about the engineering that backs their favourite technologies. 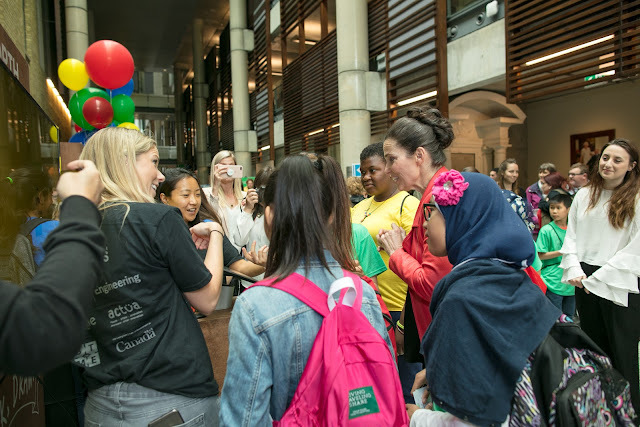 The lead partner, the University of Toronto, worked with Google and Actua to bring this massive event to life for the third year because we believe that it is critical for youth to experience current innovations while seeing their peers excited about STEM. Whether students want to become doctors or game developers, STEM skills and computational thinking are, and will continue to be, important tools for their future. For more than 20 years, Actua and our 36 university and college-based network members have worked to prepare young Canadians to be innovators and leaders by engaging them in exciting and accessible STEM experiences that build critical skills and confidence. This includes our Codemakers program, supported by Google, which has engaged over 165,000 youth in computer science and digital skill building. Canadian youth from all over the country have participated in Codemakers whether through coding throat singing in Canada’s north or printing 3-D selfies in Vancouver or participating in events like today. With a recent renewal of $1.5M in funding from Google.org and $10 million in funding from the federal government through the CanCode program, we will continue to evolve the Codemakers program to reach a quarter of a million young Canadians. Students got the chance to go hands-on with tech in Innovate Alley, from creating mini-ziplines to building their own 3D printed objects and much more. Together we can help students gain the skills and confidence they need to use technology to solve the world’s biggest problems. Posted by Jennifer Flanagan, President and CEO of Actua. Editor’s Note: Today’s blog is guest authored by Jennifer Flanagan, President and CEO of Actua. The University of Toronto is one of 36 Actua network members across Canada annually engaging 250,000 youth in hands-on STEM learning. Summer is prime time to tackle those home renovations that you’ve been putting off all year. We speak from experience when we say undertaking a reno can be a daunting task -- but it doesn’t have to be! Thanks to innovative advancements in smart home technology, it’s become easier -- and more cost-effective -- to modernize your home and ultimately add value to your property without the hassle of a construction crew. Stay cool this summer and save money at the same time by installing a smart thermostat that learns your behaviours and programs itself to save energy. The best part? It can be installed in less than 30 minutes, so you can spend more time enjoying your home. One of the most common design questions we get asked from renters or new homeowners is about how add personal DIY touches to their space. Well, one of the quickest and easiest ways is to adjust the lighting. You can add ambience to any room in your home with the Philips Hue Smart Personal Wireless Light Bulb Starter Kit. Create the feel of a sunset in the living room or set the perfect shade of light and brightness for reading a book in bed. What’s more is that Philips Hue works with the Google Assistant, providing you with a hands-free lighting experience. With commands like “Hey Google, dim the lights in the bedroom” or “Ok Google, turn on tropical twilight in the living room” you can have a fully customized experience that’s as easy as screwing in a light bulb. Together with Google Home Mini, WeMo offers hands-free control of your smart home. Whether you’re brewing your morning coffee or cooling down under a fan, the Google Assistant allows you to control your small appliances with the sound of your voice and a simple command. This can be especially useful for morning routines. Beat the morning rush by saying “Ok Google, turn the coffee pot on.” As a bonus, your Google Assistant can also give you valuable information about your day, such as your schedule, weather and traffic conditions. So go ahead and hit that “snooze” button for an extra 5-minutes. Easily create an immersive entertainment system that you can control with the sound of your voice. Whether you’re playing the latest hits on Spotify for a summer soiree or having a cozy night in streaming Netflix with your Chromecast, your Google Assistant and suite of Google Home products will allow for hands-free entertainment. And if you’re feeling a bit competitive (not that we’d know what that’s like..), you can play interactive trivia games with your Google Home. With Nest Hello you'll always know who's at your front door, even if you're not at home. This video doorbell provides a live view of your front door and sends you a mobile alert when someone approaches, rings the doorbell, or leaves a package. And when you are at home, your Google Assistant can announce when someone's at your door. Gone are the days of having to greet unexpected guests! Editor’s note: Today’s guest post is brought to you by renovation experts Drew and Jonathan Scott, the dynamic team behind HGTV’s Property Brothers. Through their popular TV shows, Drew and Jonathan help families buy, sell and renovate homes.